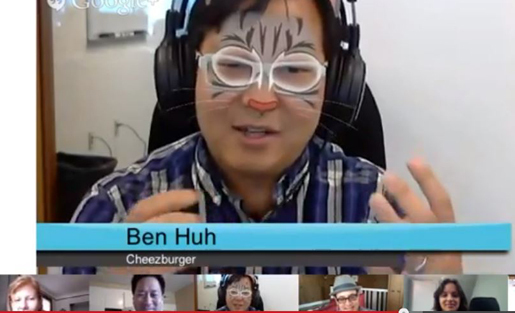 Cheezburger CEO and Circa co-founder Ben Huh gave himself a cat-like look on our Google Hangout to discuss the dominance of cats online. With Yahoo’s $1.1 billion purchase of blogging platform Tumblr, this week’s podcast will focus on the future of the two companies and how, or if, they’ll survive the transition. Will Yahoo become the youthful information hub it struggles to be, and will Tumblr finally become profitable without alienating its users? Then, in the wake of the Justice Department’s acquisition of AP phone records, newly revealed court documents show that the DOJ investigated Fox News Chief Washington Correspondent James Rosen as a “co-conspirator” in a case against a State Department adviser accused of leaking classified information. We’ll follow up on our conversation from last week on the balance between the First Amendment and the need to ensure national security. Finally, we’ll chat with our special guest, Ben Huh of Cheezburger, on why cats dominate the Internet. The roundtable will be hosted by MediaShift’s Mark Glaser, with regulars Ana Marie Cox from The Guardian, Mónica Guzmán from the Seattle Times and GeekWire, and Andrew Lih from USC. Mark Glaser is executive editor of MediaShift and Idea Lab. He is a longtime freelance writer and editor, who has contributed to magazines such as Entertainment Weekly, Wired and Conde Nast Traveler, and websites such as CNET and the Yale Global Forum. He lives in San Francisco with his fiancee Renee and son Julian. You can follow him on Twitter @mediatwit. In a record-setting acquisition, Yahoo bought Tumblr, a blogging platform created by David Karp, for $1.1 billion. Yahoo CEO Marissa Mayer promised to be “hands-off” and “not to screw it up” and allow Tumblr to continue to be a popular publishing tool, which boasts about 175 million users, second only to Facebook and Twitter, respectively. Tumblr serves Yahoo’s interest in creating a platform for original, engaging content and a youthful audience. And Yahoo serves Tumblr’s interest in growing its nascent advertising. For a look into the future, perhaps turn to Flickr, a company Yahoo bought, largely ignored, and recently revamped. Will this gamble work for Yahoo? Can Tumblr make money without alienating users or advertisers? What is its strategy, and what should it be? Has Karp, who has rejected notions of selling Tumblr in the past, sold out? It’s not unusual, especially in the Obama administration, to investigate and try government employees who leak classified information. But investigating journalists, those receiving the information, for violating the Espionage Act creates concern. How do we balance safeguarding the First Amendment and ensuring national security? Does this impact the ongoing discussion of the very definition of a journalist (do we include bloggers and WikiLeaks in that occupation), and how? Plus, the public has largely shrugged off the AP snooping. Will this story have legs? Since ancient Egypt, cats have been a subject of worship and fascination. Today, they’re just super-precious. We’ll talk to Ben Huh of Cheezburger and Circa about why our feline pets dominate online (and not our dogs). What will happen to Tumblr?